Want to trick the kids into eating spinach? Serve them this buttery, flaky, cheesy strudel with a big green salad and a creamy yoghurt sauce. Finely chop the shallots and garlic cloves. 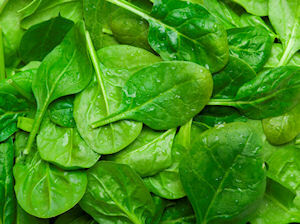 Mix with the spinach, cottage cheese, soured cream, 1 egg, cheese, salt, pepper and nutmeg in a bowl. Roll out the puff pastry and place onto a baking tray lined with parchment paper. Spoon the filling down the centre of the pastry sheet, then fold the pastry up and over the filling, making sure the ends are also folded up. Brush the seams with a beaten egg, then carefully turn it over so that the seam is on the bottom. Brush with the rest of the egg, then cut a few slits in the top and cook for 30 minutes. This would also be very tasty with a tomato sauce to cut through all the richness. Blend fresh tomatoes, onions and garlic for a simple sauce. This recipe serves 6.